Cost: The Express Elevator Lunch Menu is priced at £40pp for 2 courses – starter, main (or main and dessert), a side and mineral water. For a 3rd course, desserts can be added at £7 each. The menu also offers the option of unlimited white or red wine for £20pp or Chandon sparkling wine for £25pp. The menu is available Monday to Friday, from 12:00 to 2:45pm. 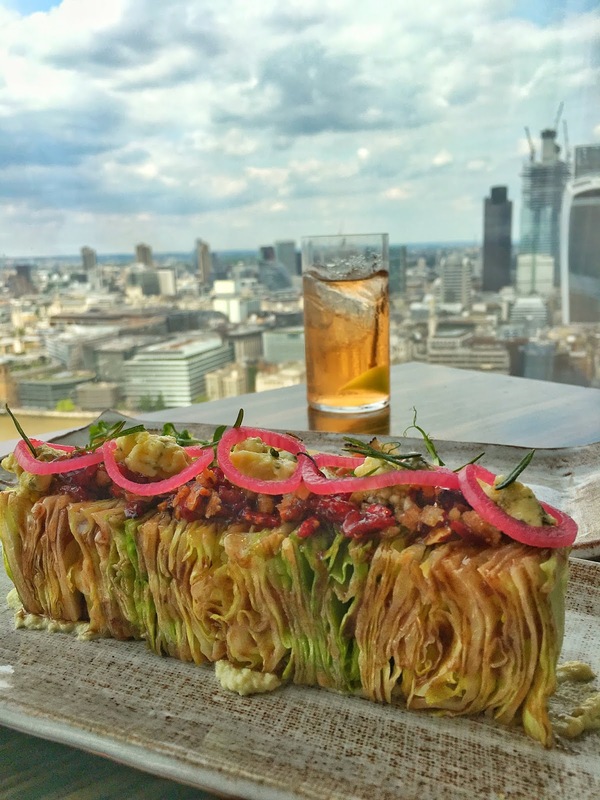 About: Oblix West has been a notable feature of the London dining scene since 2013, when it was opened by the chef and restaurateur Rainer Becker (of Zuma and Roka fame). It’s a regular destination for City folk and the occasional celebrity. Regular readers of The London Foodie will know that we are fans of both Zuma and Roka, as you can read here and here. On the 32nd floor of The Shard, arriving at Oblix West is an experience in itself. Security staff, state of the art lifts, and hostesses to bid us welcome give a real sense of occasion and anticipation. 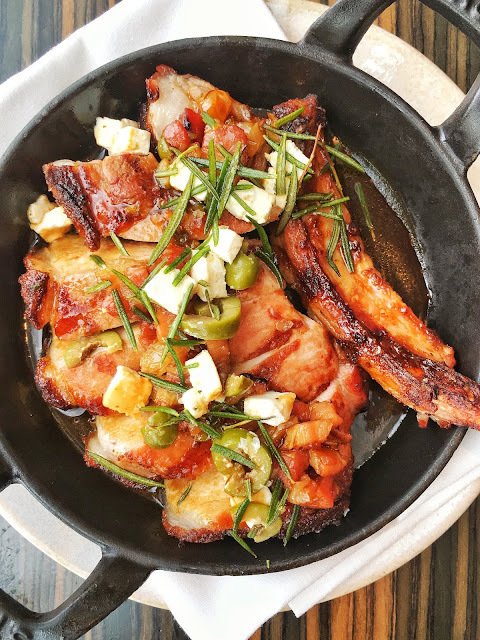 As the name suggests, the restaurant is on the west side, while on the east is Oblix East, a bar with a more casual menu, and live music in the evenings. 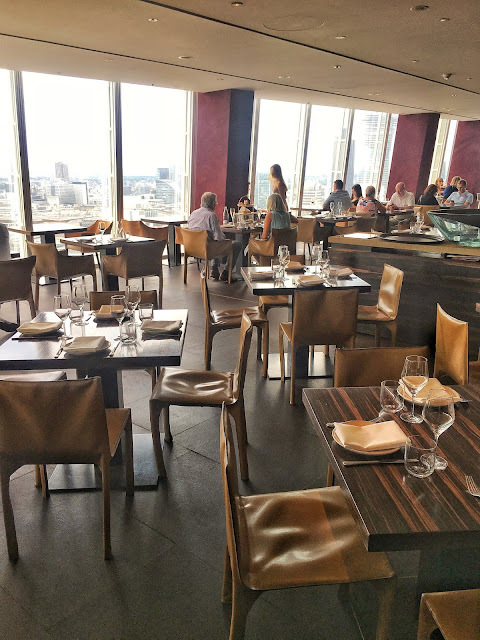 Oblix West is a spacious, sleek restaurant, with a buzzing open-plan kitchen, presiding over magnificent views of the London skyline. The Express Elevator Lunch Menu (go up, dine and down in an hour) has been designed for those who like to dine out for lunch but are time-pressured. 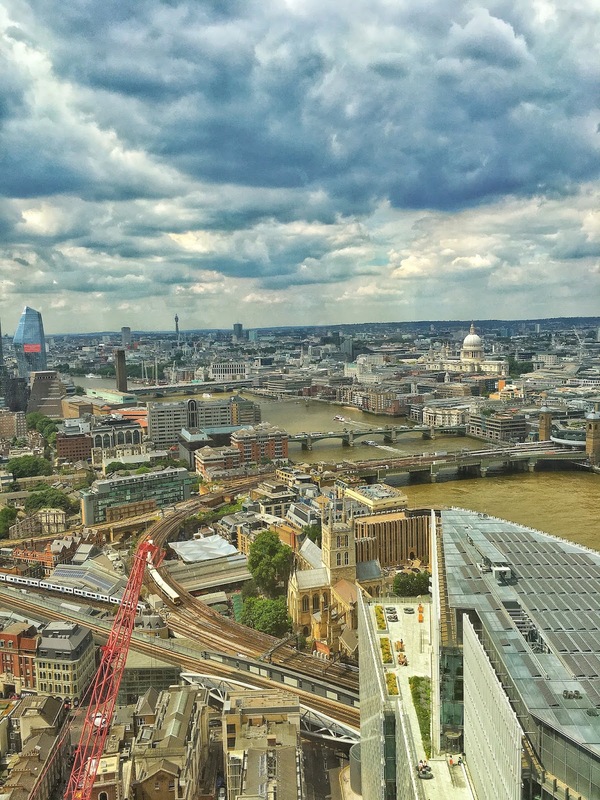 It is aimed at those heading out for a lunch meeting, as well as those visiting the capital and seeking to lunch in style, enjoying delicious dishes and incredible views across the city. 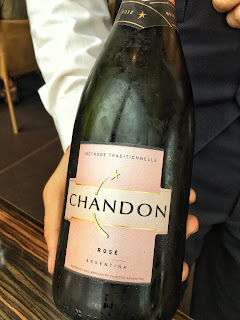 However, the unlimited sparkling wine option (see What We Drank) as well as the tempting desserts meant that there was nothing express about our visit! What We Ate: We started with the truffle flatbread, pancetta and ricotta. With a heady scent of summer truffles, the shavings were sitting delicately on top of the ruffled ricotta and pea-shoots. 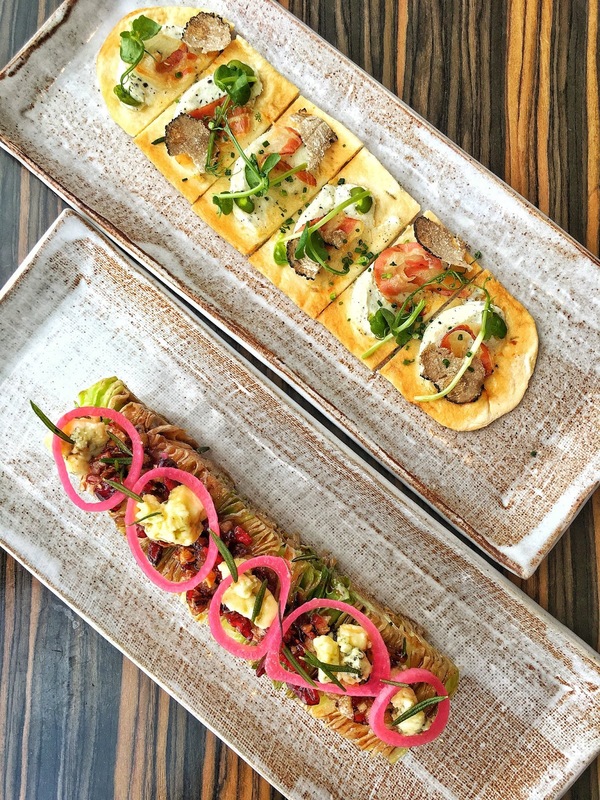 The flatbread was crunchy and still warm. If you like truffles, you will love this. Next up was the sculptural iceberg lettuce (a signature dish of the restaurant I tried on an earlier visit) with caramelized walnut, candied cranberry, pickled onions and crumbled Stilton, sprinkled with pancetta and pan-roasted fresh rosemary leaves. This is the poshest iceberg lettuce wedge I have come across, and I thoroughly enjoyed it. The first main course was pork chops with feta cheese, olives and pancetta served with freshly-made apple sauce. The pork was tender, richly marbled with fat, and very well flavoured. What a rare joy to find pork of this quality in the UK. The triple-cooked hand-cut chips were the perfect accompaniment. 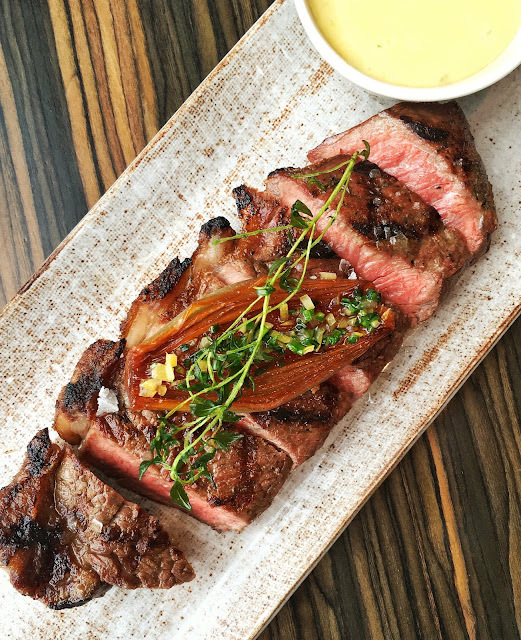 The 200g beef sirloin (supplement of £4.50) was served with a light, freshly-whipped Béarnaise sauce. 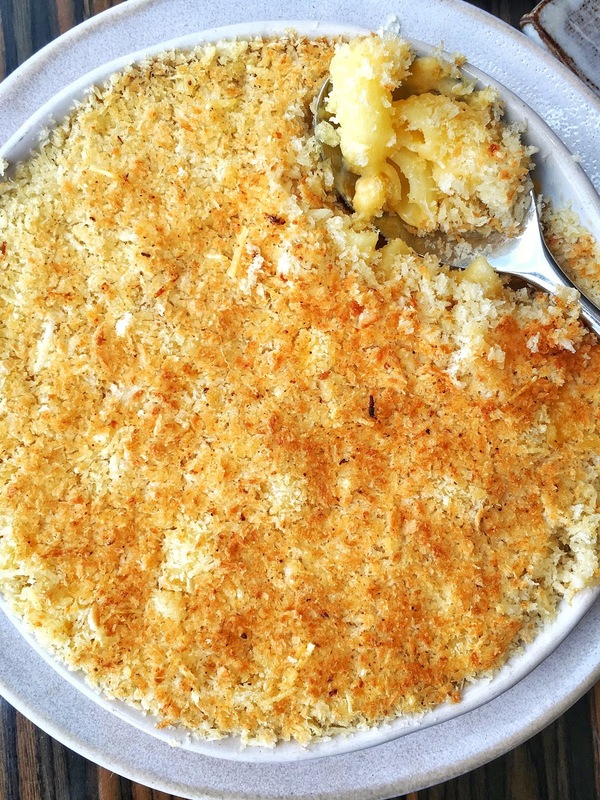 The meat was tender, flavoursome and perfectly cooked just as ordered, while the side dish was a well-made Macaroni cheese. 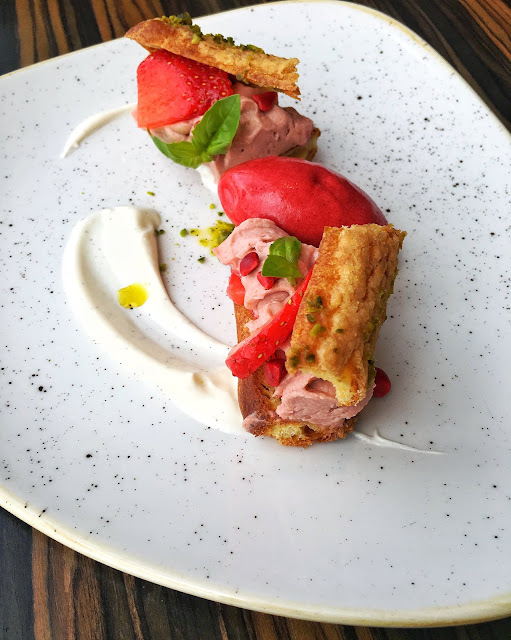 For dessert, the light and crunchy strawberry pistachio éclair had great textures. It was served with a refreshing raspberry sorbet, and sprinkled with fresh basil leaves that added an herbaceous lift. Even better though was the toffee banana & crème brûlée tart with coffee ice-cream. 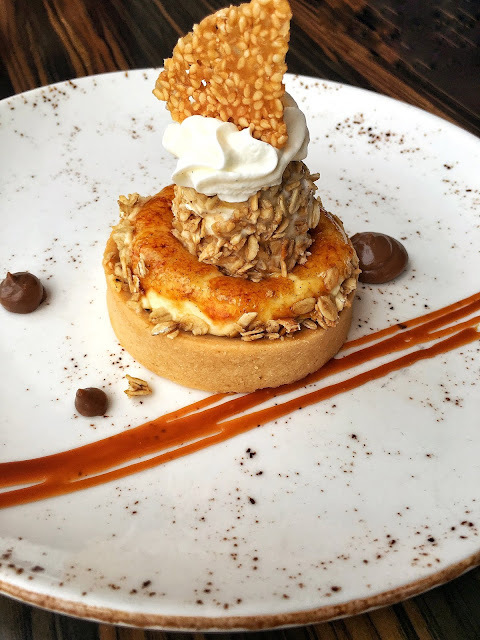 The light pastry and crispy oats were dreamy. This dessert made us gasp with pleasure. I would go back to West Oblix for that dessert alone. What We Drank: Cocktails are not included in the Elevator menu, but proved irresistible on this glorious London summer day. 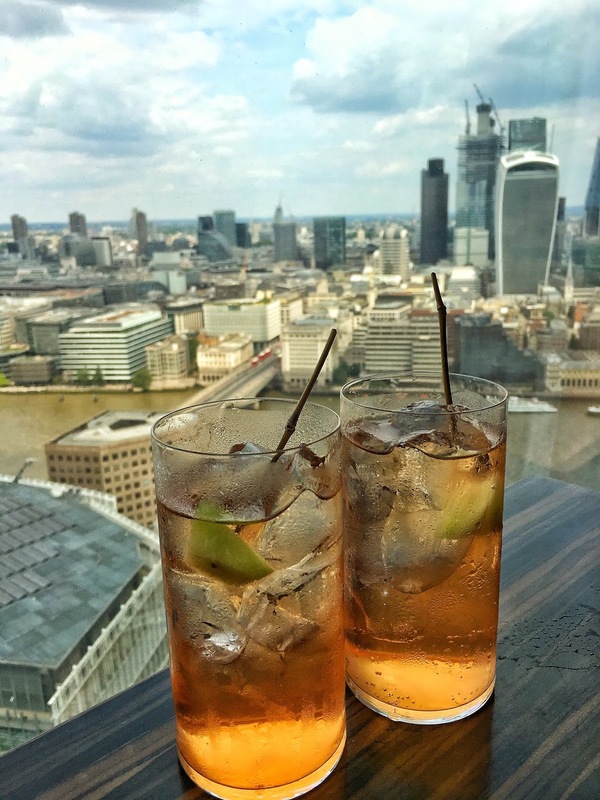 We had a refreshing Melon Spritz (£14.50) - a mix of gin, Aperol, bergamot, cantaloupe melon and Champagne. 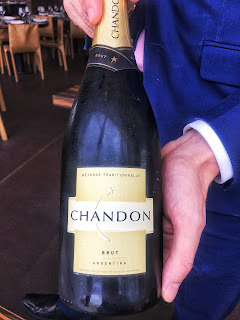 The menu offers the option of unlimited white or red wine for £20pp or sparkling wine for £25pp by Chandon. We opted for the latter, and had a few glasses of the excellent Chandon Rosé – created by Moet Chandon, using native Champagne varietals Pinot Noir and Chardonnay and produced in Argentina. This is perfect for summer days, with its fine bubbles, delicate flavours and soothing light peachy hue. Likes: Spectacular setting and views, that banana dessert was the best thing I have eaten in months. Both the pork and the beef mains were fantastic, and it was great to have the option of unlimited, good quality bubbly. 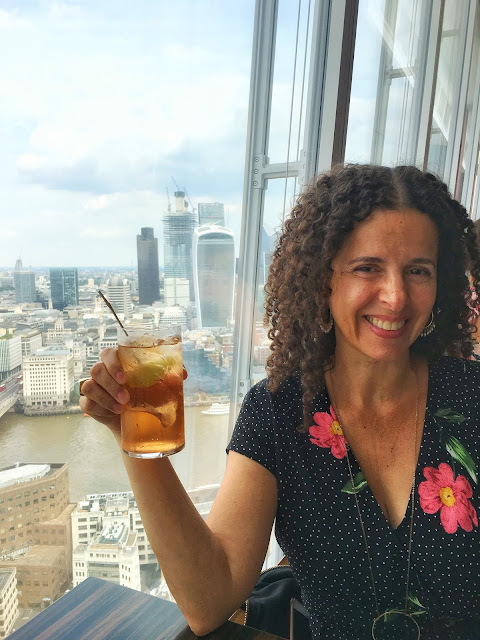 Verdict: With great food, spectacular views and very fine bubbles, the newly launched Oblix West Express Elevator menu has it all, and at £40 per person (excluding drinks), it’s excellent value too. Highly recommended.